The 63rd FilmFare Awards (South) was held in Hyderabad on Saturday evening, June 18. Various film personalities from the southern film industries presided over the ceremony. The best talents across the four southern industries – Tamil, Telugu, Malayalam and Kannada- were felicitated by Filmfare. Predictably, I (Tamil), Baahubali (Telugu), Ennu Ninte Moideen (Malayalam) and Rangitaranga (Kannada) swept most of the awards. 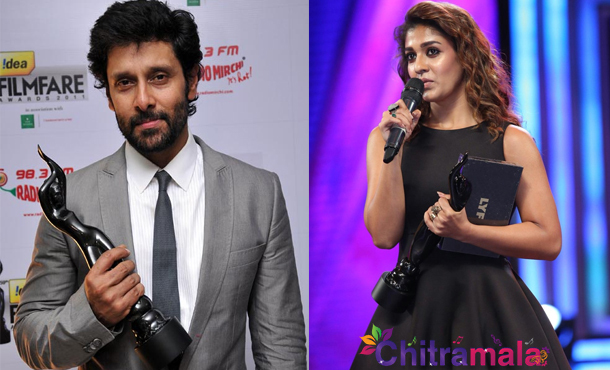 Vikram and Nayantara, who have been paired opposite each other for the first time on screen in their upcoming film titled as Iru Mugan, walked away with the Filmfare awards for ‘best actor’ and ‘best actress’ respectively at a glittering function held in Hyderabad. Vikram won the best actor award for his performance as a body-builder turned suave model in “I”, he dedicated his award to family and talked about how they coped up with his physical transformations in the movie. The same movie “I”, which also won the Music Director Award for A.R Rahman, Best Lyrics for Madhan Karky and Best Playback Singer (Male) for Sid Sriram for the song “Ennodu Nee Irundhal”. The ageless beauty and extremely talented Nayanthara won the award for Best Actress for her unconventional performance as a hearing impaired girl in ‘Naanum Rowdy Dhaan’, who gave out a “big hug and big thank you” to her director Vignesh Shivan, whom she is rumored to be dating.